Found any funding lately? We are like other niche museums working to safeguard big ideas, frugally hunting for the right partners who aren’t constrained by convention. Maybe we can help each other. Except for windfalls and fortuitous serendipity, funding new ventures starts with a seemingly forlorn search. Funders have resources and goals, but look to others to do the work. Founders have the passion for the work, but not necessarily the funds. The broader the idea, the easier the search. The narrower the idea, the more reasons to find help about how to find help. Welcome to the world of finding funding for the History of Computing in Learning and Education Virtual Museum (HCLE). Some ideas are obvious and global. Memorials for wars, archives for art, libraries for personages, all have people who felt passionate about them. Their establishments required massive fundraising campaigns, but that’s also because they could expect to reach massive audiences. Intense emotions are behind the Vietnam and World War II monuments. Pivotal artists like Picasso or Ansel Adams have a core of patrons from which to draw. Presidential libraries count on dedicated constituents to build impressive facilities. Some ideas are just as vital, yet easy to overlook. HCLE aims to help everyone understand how he or she learns. More particularly we highlight how computing has changed that process. Within the last few decades we have new tools to help us learn, and yet there’s no museum, archive or website dedicated to preserving and understanding that history of these innovations or their implications — except HCLE. Funding a museum about one topic is hard. Funding a museum about two topics is harder. Funding a museum about three topics is hardest. As we approach funders, we encounter computer advocates who aren’t much interested in education, education advocates who are interested in tomorrow’s technology but not yesterday’s, software enthusiasts who are only passionate about games but not what the player learns from them, proponents of each major topic who realize the major topic isn’t covered well enough and therefore are less inclined to support the work at the boundaries where the overlaps live. 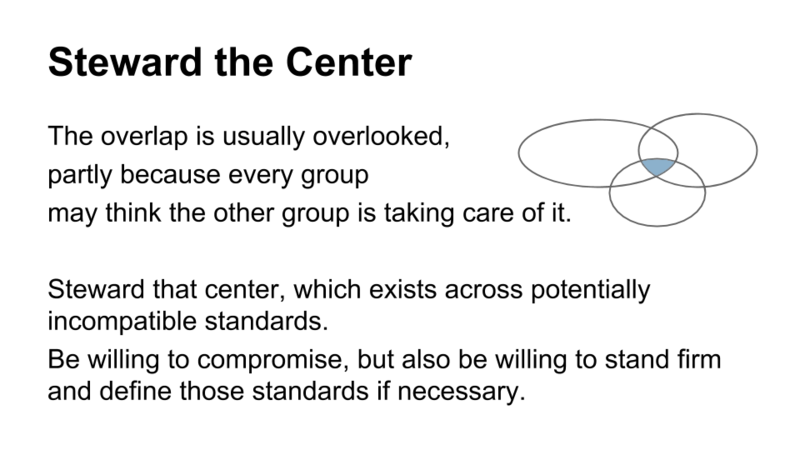 As a result, we must have many more conversations with organizations that aren’t focused exactly in our hybrid field. We hope to find enough common ground to fit into their agendas or to convince them to adjust their organizational borders. Established museums have, almost by definition, established funding. The initial hurdles have been cleared, and while funding may change, there’s a history of sustained performance, an audience, and direction. If one funder leaves, another may be identified through association. Almost every non-profit has a tenuous future, but momentum helps. New institutions like ours are especially challenged. We are like many niche, small, and new museums. Our momentum may not be as impressive because momentum is mass times velocity, and no matter how fast we work, we don’t have much mass behind us. We can’t demonstrate the sustainability of our future because we’re still creating our present. We’re doing as much as we can with what we have. We are frugal by necessity, doing a lot with very little, relatively speaking. Frugality and efficiency are not key criteria for funders. They may be fine criteria ideologically, but in reality the criteria are more bureaucratic and historic. Conventional grant processes ask for information that is reasonable, except in proportion to the size of the organization asking for the funds. Large and small grant proposals take almost the same amount of scarce organizational resources to complete. A five page proposal sounds simple, yet if it asks for historical financial reports, several negotiated commitment letters, detailed program plans, while adhering to strict formatting, then a small museum can be so overwhelmed that all the day-to-day museum work must be postponed for days or weeks while proposal writing is going on. The process is nearly the same for a grant of a few thousand dollars as it would be for a few hundred thousand dollars. As frustrating as a niche’s search may be, it is encouraging to know that diversity provides possibilities. Unconventional ideas do succeed. Take an entertaining look at some niche museums in a recent Mental Floss video about weird museums. Almost all of them found funding though probably through unconventional means. Ironically, the History of Computing in Learning and Education actually touches on a trending topic: EdTech, Educational Technology. Billions of dollars are being spent on technology for learning, both inside and beyond the classroom. People and organizations are trying to solve problems in, and change the future of, education and learning through the use of hardware, software and communications technology. Unfortunately, these people often fail to look back at the problems of the past and previous attempts at solutions. We sit at the periphery of many topics, as do many niche organizations. We’re working towards funding by talking to as many of our neighbors as possible. If you can think of some person or organization to contact, please pass along their contact information. And, if we can do the same for you and your organization, please contact us. The best resource we have is each other. Get ready to hit the Oregon Trail. Buy your oxen, fill your wagon, climb aboard. That’s the way the computer game, Oregon Trail, is played. In its original 1972 incarnation the players had to learn how to log into their timeshare computer and load the program before they could play. Learning about the real Oregon Trail was likely to be a secondary activity. Games for education are back in style, as if they ever left, but there’s a lot about how and what they teach that we have yet to learn. Even after 40 years of using computer games and simulations to teach, educators still have little quantitative proof that games are an effective method for attaining academic goals or what factors can improve a game’s impact. Oregon Trail is unique because the same theme, informational content and player actions have been used in new versions of the game every few years for decades. We plan to use these successive versions to test the educational effectiveness of the various versions from player-typed text listings to plug-and-play, heads-up, high-resolution, video games. To understand how computer or video games promote academic learning, the factors that influence retention of the target information must be isolated and most of them held constant while a single factor is varied separately. One such factor is the format used to present the educational content (e.g. text, type-writer graphics, crude cartoons, complex cartoons and realistic video). Oregon Trail is old enough to have versions throughout the range allowing us to explore the impact of these different forms of presentation on the learning outcomes of comparable players. The variables are complex — more than ‘computer vs. no-computer’ or ‘game vs. drill sheet’. Museum visitors will have the option of playing one or more versions of Oregon Trail, online, with the same academic content. What varies is the presentation (stimulus). Today anyone can play Oregon Trail by searching online or by firing up a Nintendo. The goal is to survive the journey. The hazards for the pioneers were real, but can feel abstract if just presented as text and paragraphs. As a game (which ironically is abstract or at least virtual), the players must make choices based on uncertainties, strategies, and contingencies. They learn about some of the challenges and can better appreciate what the pioneers went through. Originally, anyone wanting to play Oregon Trail could learn the same things about the pioneer journey. In addition they might have to learn typing, programming, debugging, and other computer skills. The player was also more likely to be aware of the assumptions and equations that were the basis of the game. They typed it all in. A missed zero could radically change the outcome, and that would also become an accidental lesson in sensitivities and a decreased expectation that computers are infallible. Garbage in, garbage out was much more apparent. The current and historical experiences sound like two dramatically different learning events, so it is easy to accept that one is better than the other. Assumptions aren’t as powerful as measurements; and there are very few measurements of such comparisons. The Oregon Trail Virtual Museum Exhibit that we will host is one example of why we are building the History of Computing in Learning and Education Virtual Museum. Creating the exhibit will allow the curious to check their scores across versions; and will also provide metadata in terms of pre- and post-test responses, game-play keystrokes and timing, and self-reports of players. The exhibit will gather enough anonymous biographical data to create comparable groups for data analysis. Most educational explorations of classroom methods use a treatment and control design administered to two comparable groups of students. The control group receives what is thought to be the same academic content delivered via lecture, paper-and-pencil drill or some other more conventional teaching strategy. Both groups are tested for various skills and content knowledge before and after the intervention. Analysis of the data will answer: a) does format correlate with retention of target content; b) does format effect time on task; c) do different grade levels of learners retain the same target content when various formats; d) does retention of target content correlate with previous subject matter knowledge; e) do players who already know the subject matter play longer than those for whom it is new information? The Oregon Trail Virtual Museum Exhibit addresses the persistent question of whether educationally significant results can be gained from the use of computer games and what design factors impact game effectiveness. It may also be useful for game designers. And, of course, it will work best if it is also fun. Wagons ho! PS Want to watch our progress? Check out the Oregon Trail page on our wiki. We’ve only just begun. A week ago, Liza and Tom represented and presented HCLE at the Museums and the Web conference. Like many of the attendees, we published a blog post to collect our thoughts. This last week was a good opportunity to read posts from others to get a different perspective. Many of them are useful (search on #MW2014 if you want a long list) and one in particular struck a chord in ways the author probably didn’t intend. Thank you, Kati Price, for an inspiration and a reason for reflection. Kati summarized the conference in “Ten Digital Lessons”. Taking the headings alone points out the similarities between technology entering the museum space and technology as it entered the classroom – decades earlier. 1. Digital transformation is hard – Change is rarely easy, and change that involves technology introduces change in capability, control, and complexity. If capability didn’t promise an improvement the change wouldn’t happen. While technology is potentially enabling, it also shifts some of the control to the computer, and the computer operator. That can be an uncomfortable challenge to existing authority figures. Computers make our lives simpler? Does anyone expect that, even with today’s mature technology? Imagine what it was like for a teacher in 1976 operating without support. 2. Measure what you value not value what you measure – We manage best when we can measure the critical outcome; yet, that’s always been an issue with education. Computers allowed data collection, but it wasn’t necessarily the right data. If it was, there’d be far fewer debates in the education field. The sooner the right measures are found, the sooner things improve. 3. There’s a load of brilliant free stuff out there – That wasn’t as much the case with the early computers, and yet, somehow teachers with very little budget found supportive companies and organizations that would open access to closed systems; or, with the right convincing, provide a machine or two. Software was free. All you had to do was write it up and type it in. Good luck, and celebrate the fact that it will be a learning experience. 5. Modes and motivations are more important than segments and sectors – Much of human progress is driven by passion, curiosity, and necessity. Educators were motivated by a love of helping others learn; regardless of logic about markets and demographics. They aimed at a future that redefined segments and sectors. 6. Responsiveness is not just about devices – A common mistake in any technology introduction is to focus on the equipment. A lot of effort and expense may have been involved in acquiring it, so naturally it draws attention. But it is necessary to remember why the device was introduced. Hardware without software is useless; and software that provides solutions that have nothing to do with the problems is equally useless. Remember #2, what is truly of value? 7. There’s a fine line between content curation and creation – The analogy may not be as strong here, but we at HCLE have to deal with what to curate. What was truly created in a classroom in 1976: a piece of software, the beginnings of a network, a new way to learn and teach, or a group of educated students? 8. Work out your MVP – At MW2014, MVP was Minimum Viable Product, to distinguish if from Most Valuable Player; but for HCLE, Most Valuable Player is important to us. We are trying to identify and understand the influence of the Most Valuable Players that influenced the way we learned a new way to learn. See our Pioneers list for a start. 9. US Museums rock – This is true, and we are impressed. (We’re also impressed with their budgets, but that’s another issue.) As we develop our museum though we’re becoming that much more aware that our issue is global and that HCLE may eventually not be considered to be a US museum. The nature of a virtual museum means we may be sees as international, and necessarily multi-lingual and multi-cultural. 10. Museum digital folk are awesome – Yep. No argument there. The question arises, “Why got to conferences?” HCLE lives at the intersection of so many fields (e.g. museums, history, computers, computing, education, learning) that the only conference that targets us would be one that we held, and it would be very small. But Kati’s post is a good reminder that the insights are powerful even if the specifics aren’t exact. Thanks to everyone for their points of view. And keep in mind, the transition museums are going through now may be very similar to transitions that have already taken place. It is a good reason for all of us to look outside our own fields. (Which is something we are doing too, but that’s another story. The Museums and the Web conference returned, and we did too. (See last year’s report.) Museums and the Web is a good place to meet people who understand museums and technology – a good thing for a virtual museum. Small museums require networking, collaboration, and exposure – all things we got by attending. The ultimate direct benefit from such an event would be to find enough funding to more than pay for the trip; but that is uncommon. Except for the vendors, it is doubtful that anyone achieved that goal. There were significant benefits but they are the valuable intangibles of ideas, contacts, and publicity. A small museum has a better chance of succeeding when supported by the rest of the professional community. The barriers between the physical and virtual spaces are falling. A virtual museum is not seen as radical, though it is uncommon. We are maintaining a list of virtual museums so we can coordinate and collaborate without attending conferences so we encourage you to send us URLs for any that you know of. One of the most heartening, and hardest to quantify, experiences was that we were recognized. In addition to the talk, we participated by engaging in the discussions, Q&A, and breakout sessions that allowed for a much more active role than simply sitting in the seats. HCLE didn’t have to be explained as often. Conversations were about progress and advice instead of simple explanation. We even had an informal program plan review that affirmed our strategy and tactics. And we received a very detailed and impassioned description of the value of graph databases (via Post-its). We haven’t decided if we will if it will be necessary to return in 2015. Unless HCLE has more significant funds we’ll be best served by attending a different conference, possibly an education conference. 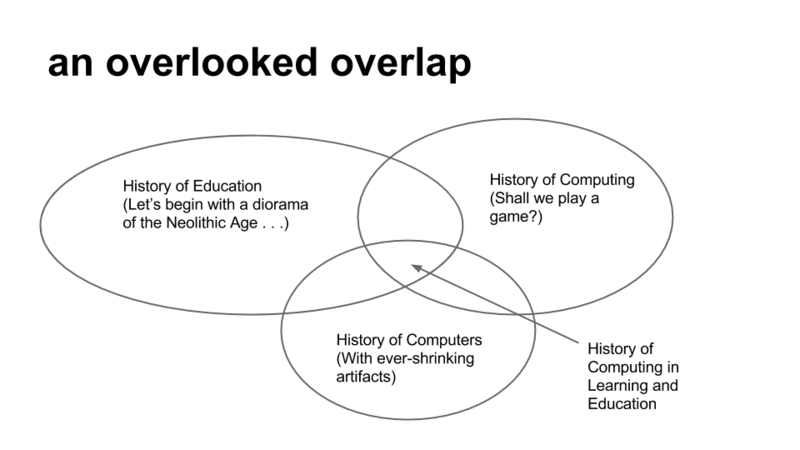 An education conference won’t provide as much useful technical advice, but it may connect us with people equally passionate about the history of computing in learning and education. Of course, the best course would be to have sufficient funds and time to attend conferences that cover each of our topics: museums, history, computers, computing, learning, and education. But we have a lot of work to do with cataloging, archiving, site development, exhibit creation, and a myriad of other tasks. We are certainly busy. HCLE will be present at another conference in 2013, partly through convenience. The American Alliance of Museums holds a large annual meeting, and this year it is in Seattle, which means that our Project Manager, Tom Trimbath, can attend by commuting thereby dramatically decreasing the cost of lodging. The true value of the conference will become evident as we follow up on contacts and ideas. We’re already received interest from universities in the UK, and of course established better relations with various museums in the US. And if nothing else, our social media presence increased by about 20% simply through persistent tweeting (which also gave us an opportunity to comment on what we heard.) Speaking is important, but so is listening. Thanks for letting us listen. Many museums, libraries, and archives are creating virtual versions; either because of outreach, costs, or experimentation. Overlaps between museums create niches that inspire small, targeted museums; but, the inefficiencies of small museums can overwhelm small staffs and budgets. One solution is to go virtual. In HCLE’s case, other museums cover History, Education (from the dawn of history), Computers (from room-sized machines down to ingestible devices), and Computing (there’s a demand for games). They overlap, but insufficient funds mean the core missions of museums can fade at the borders. HCLE is preserving the intersection of three. Funding niches is harder than funding broader museums. The broader the topic, the larger the audience, and the greater opportunity for fundraising. Cover the intersection of two topics, and the remaining set is a smaller number. Cover the intersection of three topics and the population becomes quite small. Disadvantages can become advantages. Competition encourages HCLE to duplicate each type of museum, which is expensive. Besides, each type of museum has a different culture and requires a different infrastructure. Collaboration instead of competition means duplication and costs are reduced. By contributing appropriate artifacts and efforts to established museums, both collaborators win. Topics at the border are emphasized rather than marginalized. In HCLE’s case, we need to preserve and make accessible the documents, software, lessons, and experiences that affected how society rapidly learned a new way to learn. All of that material is perishable; particularly, educators rarely formally documented the techniques they pioneered, except as newsletters and stories. We’ll collect what others won’t save. But, simply dispersing the various elements and artifacts does not enable the necessary integration for academic research and insight. Fortunately for HCLE, the remaining unarchived elements can all be digitized; which is why our museum is virtual. Collaboration eases the overall effort, but it requires above average levels of communication (a potential burden for a small museum.) We must relinquish control of most of our artifacts, because that’s the best way to improve a collaborator’s collection; while simultaneously guarding a core mission. Respecting our mission requires a stewardship of access to the artifacts while developing a common standard across disparate disciplines. The effort is large, complex, and valuable; but, the effort is far smaller thanks to collaboration. We’re attempting to fill the gap by using open source software, advancing the art of the proper catalog (using Dublin Core+), hosting the database within shareable environments (mySQL), building collaborative exhibits (Omeka), providing provisional access during development (our wiki), and researching other repositories to minimize duplication and to introduce disparate partners. HCLE’s essence is like many museums’: deliver a body of knowledge to a diverse users through a variety of avenues. Our avenues must enable: data mining for researchers, archive browsing for participants, and virtual exhibits for the casual visitor. To see our progress or collaborate, check out our wiki (for information about our database, catalog, and repository) and the draft of our first exhibits. What have you stored, collected, and privately archived? Much of the pioneering work that invented ways to include computers and computing in the classroom was inspired by necessity. Little of it was documented, and most of those documents were printed on non-archival material. We’re happy to find someone who has saved the work they did in the early computer era, and especially pleased when they’ve digitized and uploaded their collection. Eldon Berg has done that with his work. In particular, his Periodical Guide for Computerists contains lists of articles organized by topic and publication, and includes titles and page numbers. That may seem dry, but such a reference is wonderfully valuable to anyone researching the then state-of-the-art. The files are even searchable, so terms like BASIC can be queried. The entry of computers into the classroom means educators everywhere had to find new ways to teach. Newsletters, support groups, even informal correspondence chronicled some of the work. Eldon Berg’s periodical isn’t limited to education, but by putting it online he enables researchers to access the pieces they need. Eldon Berg is not alone. Many such personal archives exist. One of HCLE’s tasks is to connect with them to create a scholarly foundation of information that extends beyond the reach of any one archive. There will be a lot of reformatting, but the value is worth it. If you have such a storehouse, collection, or archive and want to be included, send us a note. We’re glad we found Eldon. We look forward to finding you. There’s an irony and an everyday lesson in building a virtual museum for how computers and computing became part of learning and education. Almost every step requires learning, and it requires a style of learning that didn’t exist prior to computers – which is yet another reason for a museum that saves the lessons from that transition. I’m not a computer expert, nor am I a neophyte. I’m a geezer geek, someone who was an expert but whose specific expertise faded in importance with each software and hardware cycle. Want someone to program Fortran IV from punch cards? How about a bit of assembly code on a Harris via tape? Okay, yes, I use real computers with monitors, keyboards, and disk drives; but, soon they may give way to virtual displays, virtual keyboards, and cloud memory. The only way any of us maintain our computer skills is from usage and a reliance on Help menus, user forums, and a lot of trial and error. Those learning skills are accepted, usually grudgingly, as part of our normal routine. Decades ago, the normal routine for learning a skill was: listen to lectures, do homework, maybe experiment in a lab, take tests, and wait for an authority figure to decree a verdict on at least pass or fail. On-the-job training existed for the hand crafts, but the rest was book learned first and exercised later. It was a model that worked for centuries. It worked because change was slow. Computers changed all of that. In the pioneering years, computers were custom built by hand, probably by the people that would become the programmers. They had no reference books. Eventually, the computers became products that could be bought, delivered, and installed – and even had user manuals, but the programming was unique and frequently poorly documented. By the 1970’s and 1980’s stability came to hardware and software, at least enough to allow teachers to arrange classes about computers and eventually used computers for classes. But, it didn’t end there. Now, we expect hardware to become obsolete within a few years and software upgrades to be delivered every few months. Very few take classes to manage the changes or new features. The upgrades include self-paced tours, which can’t convey all of the changes, just a few the producer wants to emphasize. We train ourselves by experimenting when our previous techniques fail. We scroll through menus hunting for remembered commands, hoping they haven’t been renamed. Calls for Help via social media may be more useful than perusing a Support web site. And the changes continue. Our acceptance of the self-learning task may not be apparent to anyone who entered school after 1990. I am glad I witnessed the transition, if for no other reason than I can appreciate the paradigm shifting changes that faced the pioneering teachers. No one told them how this would turn out. They helped define what to teach in-person and what can be taught by computer. Their work is the core of what we will save with the Virtual Museum. How they dealt with transition, how students accepted the new environment, and how we all live and learn differently now will finally have a home. I’ll be blogging more about the process and progress of how the museum is being built. For now, we’re established those footholds and foundations in this blog, our wiki, and our newborn social media platform. Each has been a learning experience. Each is an opportunity for you to watch what we’re doing and for you to share your stories and contributions. Stay tuned. There’s a lot more to come.